1.1 With the brakes released, use a pry bar to push the brake pad away from the brake disc to create at least 1/2 inch of clearance. 1.2 Activate the slack adjuster if additional clearance is required. 1.3 Inspect the pad and disc for wear. If the disc is light hollow worn, then choose the location of the sensor where the rods contact properly the disc (on the mid and upper area of the rod). If the disc hollow is too deep, choose other location for the sensor. 1.4 Carefully observe applicable safety rules! 2.1 For your safety, insert two brake pad-stops between brake pad and disc with the magnets facing the disc. 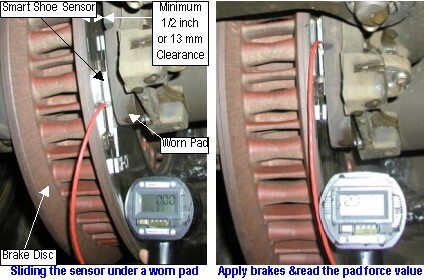 2.2 Use provided handle to carefully slide the sensor between the brake pad and disc. 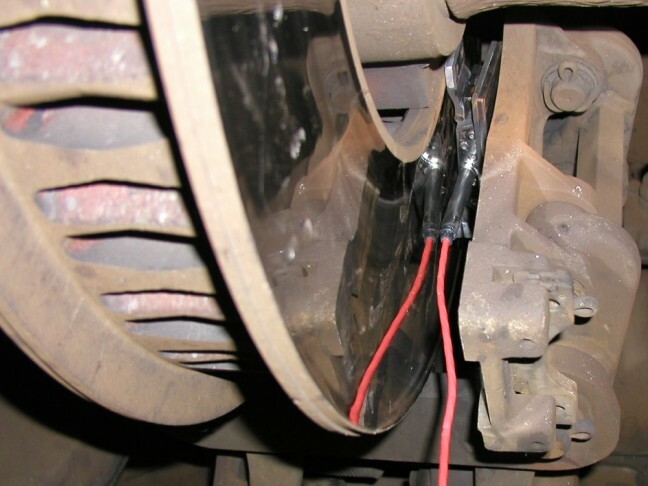 2.3 Make certain that the wing (two metallic plates connected to a rubber bridge) of the sensor is facing the brake pad. 2.5 To avoid exposing the sensor to excessive shocks, make sure there is almost no clearance left between brake pad and sensor wing. 2.6 The 4-magnet support strength will keep the sensor securely in place for several release/apply brake operations. 2.7 Remove both safety pad-stops. 3.2 Warm up the sensor and the braking system by performing at least three full service brake applications after the sensor was installed. 3.3 With full service applied, check the contact between the pad and sensor. Make sure no pad section other than the wing metallic plate area is in intimate contact with the sensor. 3.4 Release the brakes and check the pad for deep marks or dents over the area where the wing contact actually occurred. If the wing protrudes the pad deeper than the plate thickness (3 mm) then the pad is too soft for this test and must be replaced or removed. 3.5 Perform minimum three brake applications allowing the time to stabilize the brakes. 3.6 Read the Brake Pad Force directly in Pounds (lb) or daN and fill-in the appropriate log sheet. 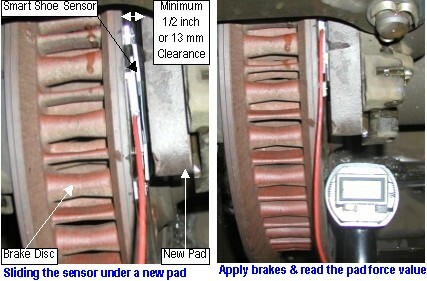 The mean value of minimum three brake applications should be reported as test result. 3.7 Before halting the test, inspect again the pad-sensor contact area. Make sure that no deep marks are on the pads. 3.8 Disregard the test results if deep marks are found. 3.9 Once testing is completed, make sure there are no forces on the sensor and, using the cable, slide it outward and remove it. 3.10 Turn Off the Indicator.